I want to connect a loading cell to the computer via USB port. The recommended excitation voltage of the load cell is 10V, and USB output is 5V. The current through the load cell is about 20mA at 10V. Is it safe to just make serial connection of 2 USB ports to get in sum 10V from them? I suppose that it would draw 40 mA at 5V from each USB port which is far below maximum USB specification of 500mA. If not, maybe there is some very simple electrical scheme to convert 5V DC to 10V DC so that it can be connected to a single port? You cannot connect two USB ports in series to obtain a higher supply voltage. You will short out the PC's power supply and although USB is specified with protection for a similar situation, many motherboards do not implement that. This means you'll short the power supply and if you are lucky you PC will restart fine after removing the short circuit. As an alternative look for a step up / buck / boost converter. These are available from many webshops/ebay for couple Dollars/Euro's and do exactly what you want: input voltage eg. 5V and output voltage most of the time adjustable. Here is a random example of what I mean. 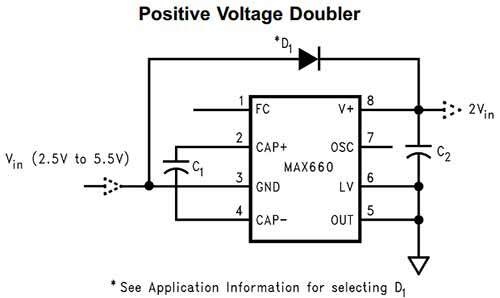 For doubling a positive voltage, i.e. the 5 Volt nominal supply from a USB port, the Maxim MAX660 switched capacitor voltage converter lends itself well to the task. The MAX660 is a higher current equivalent of the venerable ICL7660. The output will track at almost precisely twice the input voltage. So, for an input of 4.85 Volts, which is what I am measuring on my USB port right now, the output is around 2 x 4.85 = 9.7 Volts: Not exactly 10 Volts, but close enough for government work, so to speak. The MAX660 can output up to 100 mA, with efficiency approaching 90% in theory with carefully selected components. For 20 mA through a resistor, I measure the device drawing around 52 mA from my USB port on a breadboard implemented circuit. With a proper soldered circuit, even lower current draw i.e. higher efficiency should not be surprising. As the internal oscillator operates at 10 KHz in the positive voltage doubler mode (see Application Information section of linked datasheet), the very small ripple would be an issue only for high frequency work - presumably the load cell will be sampled at significantly less than 10 KHz, so there is no cause for concern. Unfortunately in this mode, the device cannot be forced into its 80 KHs internal oscillator mode, else even that ripple would disappear from consideration. Another alternative is to ask what the consequences of running the load cell off 5V would be? As I understand it, they are approximately resistive bridges, and a basic load cell should happily work off a lower voltage. The output signal would be halved : you can make that up by increasing the gain of the amplifier it feeds. Unless you need the lowest noise performance this may be a better option than adding a boost convertor. The power sources of the two USB ports are linked together. When you connect the negative pole of the one to the positive pole of the other, you're short-circuiting your USB ports. That's not healthy for your computer. What you need is a DC/DC converter. It will consume some more current (so you won't get 100% efficiency), but not too much for the port. In the 1st reference, IC555 is wired as an astable multivibrator with a frequency of 4.5KHZ and duty cycle of 53%. The output of IC is connected with the diode,capacitor charge pump so it will increase the output voltage. Not the answer you're looking for? Browse other questions tagged voltage usb or ask your own question. How to “Mirror” or “Split” bar code data scanned by one USB scanner to two computers using Y cable? How to program a microcontroller via USB using JTAG?